"What are the hardest Air Force jobs?" That is a difficult question to answer because what is considered "hard" can vary from person to person. For example, is it physical stress that makes a job hard, or is a job considered hard because of the mental stress it carries? Or perhaps a job is deemed to be difficult because of the amount of responsibility that comes with it? One place we can look for an indicator of what might be considered hard or difficult jobs is the Air Force's quarterly list of stressed career fields. In the military, "stressed" is the term used to identify jobs that are in demand but are understaffed. A job may also be stressed because of operations tempo (also referred to as op-tempo). Operations tempo is a measure of the pace of an operation based on equipment usage, such as aircraft flying hours; and how often and for what length of time an airman is deployed versus how much time is spent at home. Stressed Air Force career fields exist among both enlisted level jobs as well as officer level jobs. Foreign language skills, cyber warfare, and intelligence information and analysis are currently highly sought-after skills in the Air Force, and so the related career fields that specialize in these are in demand. Airborne Cryptologic Language Analyst (1A8): Operates, evaluates and manages intelligence information systems and operations activities, and is responsible for translating and analyzing messages. Airborne cryptologic language analysts are proficient in languages such as Arabic, Chinese, Korean, Russian, Spanish, Persian Farsi, Hebrew, Pashto, and Urdu. Cyber Warfare Operations (1B4): Design, install, support and enhance network capabilities and systems to ensure proper operation, and that those systems are secure from outside intrusion. Tactical Air Control Party (1C4): Supervises and conducts mission planning and coordination of combat air resources. They are on the frontline with the responsibility of calling in air strikes. Fusion Analyst - Digital Network Analyst (1N4): Performs and manages intelligence analysis, exploits intelligence information, develops targets and provides situational awareness for operations personnel and key leadership. Survival, Evasion, Resist & Escape (1T0): Survival, evasion, resistance and escape (SERE) personnel train aircrew members in these essential survival capabilities. Training includes adapting to all possible environmental conditions, from ocean to arctic cold and desert heat. Some of the most commonly stressed career fields in the Air Force are those of pilots. The training is often intense, and the responsibilities they carry can be enormous. Rescue Pilot (11H): Pilots helicopter aircraft and commands crews during combat, training and other missions. Rescue pilots may specialize in flying the Pave Hawk helicopter or the King or Combat King aircraft. Reconnaissance /Surveillance/Electronic Warfare Pilot (11R): Commands the E-3 Sentry AWACS aircraft, which is essentially a flying control tower. They are trained in the most advanced technologies in reconnaissance, surveillance, search and rescue, and electronic combat. 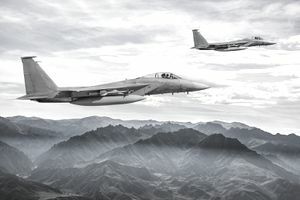 Special Operations Pilot (11S): Special Operations Pilots command either fixed-wing aircraft or helicopters and crews that accomplish special operations, training and other missions on a global scale. Mobility Combat Systems Officer (12M): Coordinates weapons and personnel in the midst of combat conditions. Mobility combat systems officers combine advanced surveillance and intelligence information with proficiency in the use of available weapons systems to choose and implement optimal courses of action to accomplish the mission.